Planning a Key West elopement? Maybe you’re excitedly on your way to Key West right now or you and your partner have decided that a traditional wedding is not the route you want to take. Planning a wedding is stressful for many, and there is an increasing interest in having a low-key ceremony in exchange for the months of decisions and loads of money. A Key West elopement offers a laid-back alternative in a tropical destination. Here's our guide to pulling off the perfect elopement in Key West. To get married in Key West, you need a Florida marriage license from any county in the state. A Florida marriage license must be purchased within 60 days and at least three days prior to the wedding day. As of March 2019, both individuals need a valid photo ID, social security numbers, and $93.50. Smathers Beach is one of the most popular spots to elope in Key West. 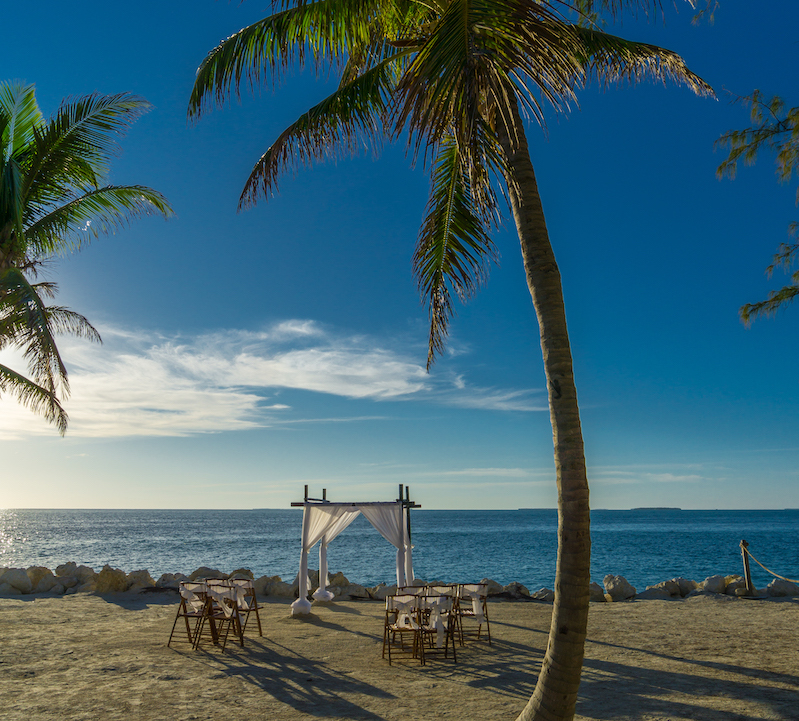 The scenic location offers an idyllic backdrop for a tropical ceremony, and of course, it looks great in photos. Fort Zachary Taylor State Park is another popular wedding ceremony spot. The 54-acre park offers plenty of spots for photos and five reservable spots for nuptials. Mallory Square is known for its stunning sunsets and view of Key West Harbor. Be near Duval Street for a post-wedding celebration from Mallory Square. Getting married in a beautiful destination like Key West is a dream for many. Key West elopement packages offer a wide selection of options for couples who really don’t want to plan anything. Area companies like Florida Keys Wedding Center offer elopement packages that include a wedding officiant, marriage license filing, photo shoot, and more. Prices start at $299 for the most basic package. Just because you’re eloping doesn’t mean that you can’t have documentation of your day. Wedding photographers and videographers capture the special moments of your Key West elopement and help you share memories with everyone back home. While many elopement packages will include a photographer, if you’re planning your elopement ‘ala carte’ style, you’ll have to find your own photographer or videographer. As soon as you know your plans, begin your search for someone to capture the moments. Book a Key West vacation rental to celebrate your elopement. Our wide selection of vacation homes in Key West offers the perfect space to unwind and take in the experience of a Key West elopement.